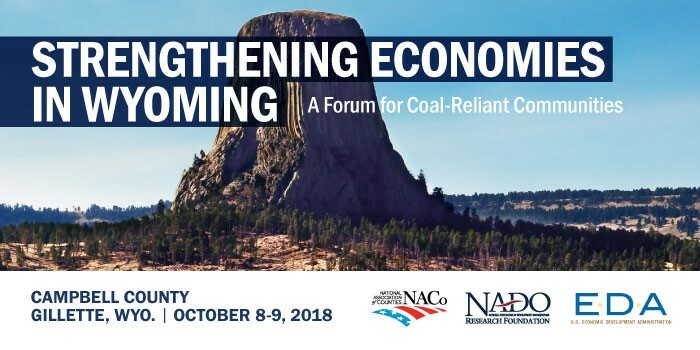 The National Association of Counties(NACo) and the National Association of Development Organizations(NADO) Research Foundation hosted Strengthening Economies in Wyoming: A Forum for Coal-Reliant Communities on October 8-9, 2018 in Campbell County, Wyo., through the support of the U.S. Economic Development Administration-Denver Regional Office. This educational and interactive forum was designed to convene and assist counties and regions in Wyoming experiencing economic and other community challenges due to changing conditions of the coal industry. This forum brought together stakeholders from local, regional, state and federal government, as well as nonprofit and private sector partners, to learn and share best practices, lessons learned and new opportunities to support economic diversification and other economic development efforts. During the event, plenary and panel sessions covered a variety of topics including strategic partnerships, entrepreneurship, community engagement, energy, research & technology, and education & workforce development. Wyoming Governor Matt Mead, as well as U.S Senators John Barrasso & Mike Enzi, joined the forum to share vision and perspective on building a stronger, more diversified economy in Wyoming. Below is the link to the full forum agenda, followed by links to the presentations, other resources and photos. 2019 NACo Legislative Conference, March 2-6, Washington, D.C.
2019 NADO Washington Policy Conference, March 18-20, Arlington, Va.
2019 NACo Western Interstate Region(WIR) Conference, May 15-17, Spokane County, Wash.